A few days have passed and I’m looking through notes and reflecting on the great sessions I attended as part of the Unusual Suspects Festival last week. In my last post, I wrote about a session on the Future of Work I went to on Wednesday. I was back for more on Thursday, attending “Excluded Assets: How can empowering marginalised groups improve cities?”. The session was led by Spice Innovations and offered me a welcome reminder of how their time credits model works. It also built on my previous knowledge to demonstrate working examples of how it can be used to boost participation for groups whose voices might not otherwise be heard. While I had anticipated few common threads with a session on the Future of Work, I was pleasantly surprised to find the opposite. One question that we touched on in my table group was around whether offering a reward (such as the credits offered by Spice), is in the true spirit of volunteering. However, following the line of argument from Wednesday’s session, this is a clear example of recognising the value of someone applying their time to an activity and being rewarded for it in terms other than cash. The examples given by the team from Spice also tied in with Professor Tim Jackson’s case for the power of work in giving a sense of respect and identity. Whether one believes this goes against volunteering principles or not, it’s clear that it has an intrinsic value and can also have broader societal benefits as “excluded assets” are recognised and enabled to participate. One of the aspects of the session that I most enjoyed was the opportunity to work with my table group and share examples of asset based models we’d seen working elsewhere. The potential for mapping and potentially replicating what works is something I’d love to see done more often and our work together showed just how quick and easy it is to “crowdsource” such ideas. I scrawled quite a few down and have listed them below, with my attempt to roughly categorise them. The final section of the morning was an opportunity to try our hands at an asset mapping exercise, for a particular group, albeit that this would ordinarily done with representatives of that group as key contributors. My table looked at young people and the results of our analysis are below. Again a number of successful initiatives and engagement examples were cited. It would be interesting to know whether young people are aware of these and would highlight the same or completely different “assets” themselves. Overall, I found this session captured three key themes of interest for me: the question of work and how we value and reward contributions, the huge range of examples of services designed with and for communities based on analysis of assets rather than needs, and the significant benefits of working together to highlight examples of what works and potentially build on these rather than risk duplication. Room for Tea – a room sharing site offering affordable short term lets, currently operating in London and Glasgow. Enrol Yourself – six month, self-directed learning marathons, making lifelong learning more affordable. Sock Mob- Unseen Tours – walking tours of London, led by vulnerably housed individuals, building on their intimate knowledge of the streets in their local area. Olio – connecting neighbours and local shops with excess food and other goods so that they can be shared, not thrown away. Nana- a café in Clapton, staffed by over 60s who face social isolation. I’ve read that sadly this enterprise has closed. 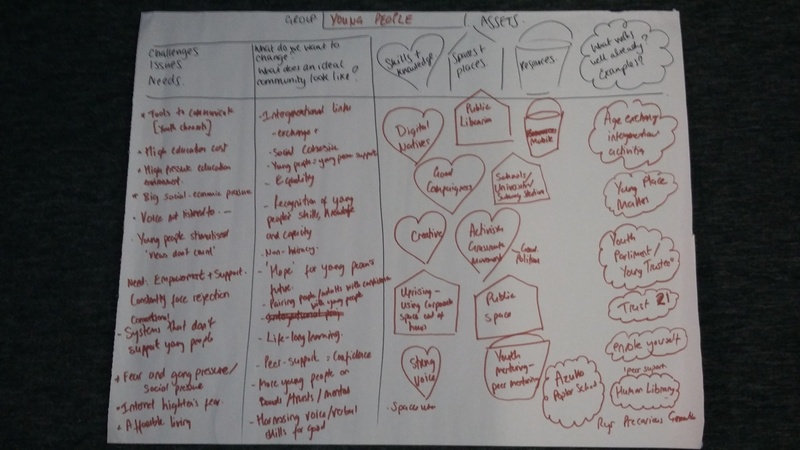 Following the session, the team from Spice also shared a copy of their impact evaluation to further demonstrate the value of their approach.